At Nagata Ward, a lot of houses were burned when The Great Hanshin-Awaji Earthquake happened. People who lived there could not return to their own property by any means. The vacant lots were used as an outdoor museum, where modern artists exhibit their art outside. Two big camphor trees caught my eyes the first time I stood at this place. These trees were still alive even though the surface of their trunks were burned. Somebody told me that when fires occur, these trees prevent more things from catching on fire. I thought I heard the voice say "We are alive, we are alive". 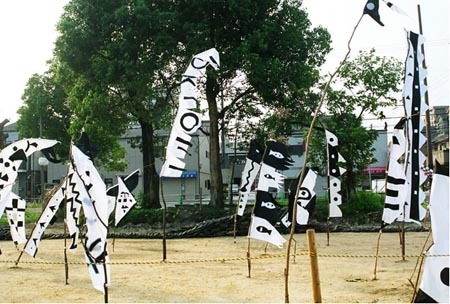 I put flags into the ground to calm down the spirits who were lost in the earthquake. Then I prayed "let wind that flows from Nagata to the world bring to mind that we should praise nature, praise human".